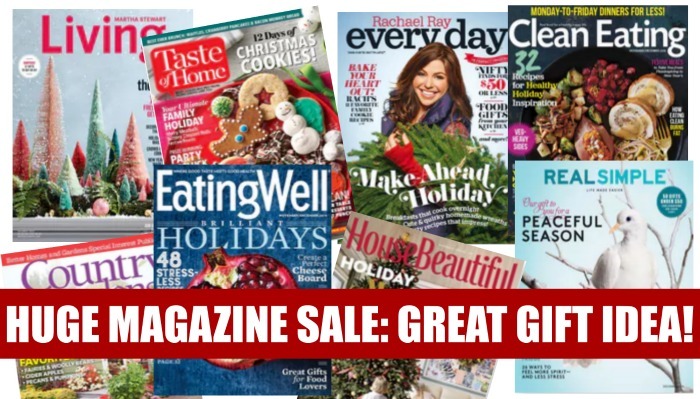 Great Gift Idea: HUGE Magazine Sale! Magazine make GREAT gifts and DiscountMags makes it REALLY easy to gift them. In fact, you can even schedule an email an e-gift card to announce your gift. You can purchase these magazines for yourself and you can even renew existing subscriptions with these prices. I have ordered from DiscountMags for years! 100s of titles in this sale!! Go here to see the HUGE selection of titles in this sale! So many popular titles and literaly 100s to choose from …something for everyone on your list! DiscountMags makes it so easy to send subscription gifts and will even allow you to select an email gift card for your recipient! Select a nice postcard with your message (99¢) OR send a free e-card. You can even select the exact date that your gift is received! Go here to see the HUGE selection of titles in this sale! Best of all … no coupon codes needed! Sale ends Monday, December 17th, 2018. Previous Post: « RARE! Cook’s Illustrated: $7.99 per Year!